Like a fragrant bouquet, this natural soap set is redolent of jasmine, peony, gardenia, and calla lily. Nothing gives your mood a lift like a bouquet of fresh flowers. Now imagine that pleasure washing over you while enjoying a hot bath or even grabbing a quick shower before work in the morning. 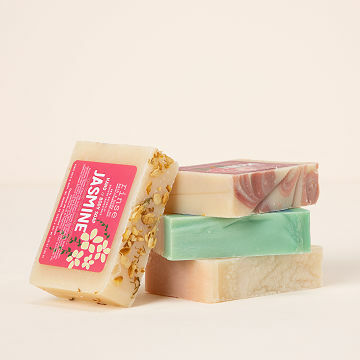 Each of the soaps in this set by Heather Swanepoel are made from pure, pronounceable ingredients that soothe and satisfy your skin--a blend of olive, coconut, palm kernel, cocoa butter, shea butter, sunflower and refined sweet almond oils--along with natural fragrances that evoke your own secret garden. There are four, fresh-picked scents to enjoy: Jasmine, Peony, Gardenia and Calla Lily. The soaps come in a presentation box perfect for gifting, or as a special pick-me-up for yourself. Handmade in Monroe, Georgia. We spoke with Heather about the joys of soap, making, and (surprise) soapmaking. Read more on our blog. Heather Swanepoel is not known for her knitting. In need of a creative outlet, she tried to teach herself the craft, but couldn't muster more than squares and rectangles. So she signed up for a soap making class with her crafty mom. When their work was uncovered, Heather's was perfect (don’t ask about her mom’s). Heather and her husband now have a family soap-making business in Monroe, Georgia, where all their products are produced in small batches to ensure quality and freshness. Cut your soaps in half to promote longevity. When not is use, allow your soaps to breathe (do not wrap them in plastic, put in a resealable container, or keep in a constant flow of water); the longer they stay dry, the longer they will last. I loved that there were four different fragrances and they all smelled so good! Very nicely packaged with a story! So glad I made the choice to buy this. I would buy again and I found so many other things on this site. I would buy this again...beautiful! Such a beautiful gift. Yes I would use them myself. I already bought this product again. It is displayed for elegance,It is used during a relaxing soak.And it is an automatic reorder item. The recipient said she loved it. It was pretty and smelled great. They smell nice ,they look pretty. They Evan make a nice decoration while there waiting to be used.